An air compressor is a very useful tool to have in your shed, office or job site. It’s got a wide range of uses from inflating vehicle tires to painting and cleaning. Thus, it is only a given that you must invest in the best 60-gallon air compressor. For our editor’s pick, we chose the PK-6060V Professional/Commercial Air Compressor from Puma Industries. This 60-gallon air compressor is packed with a lot of features that make it very reliable. First, it is equipped with an oil-lubricated, single-stage cast iron pump. This makes for a smoother operation and longer engine life. Second, you get a built-in pressure regulator and a quick coupler. The quick coupler controls the pressure of outlet air. Also, it comes with steel, never-flat wheels with ball bearings for better mobility. This model’s single-phase induction motors are equipped with an overload protection. This feature lengths engine life as it protects your engine from overheating or from self-destructing in case anything goes wrong. It is relatively portable despite its size and weight. Its sturdy, never-flat wheels and ball bearings increase portability. The oil lubrication keeps your engine durable and smooth running. This model comes with a one-year warranty. It is a pretty powerful unit at 3 HP Running, 135 Max PSI, 230/1 Voltage/Phase and a 60 Gallon fuel tank capacity. It is not as ideal for bigger projects, farms or industrial purposes. The air flow starts off as very strong but also weakens halfway through, especially if used for longer time periods. If you want an alternative that is also competitive but doesn’t break the bank, this might be for you. Industrial Air’s ILA4546065 is a very reasonably priced model for its features. It is a single-stage, cast iron, three-cylinder air compressor. Similar to the first product, it features an oil-lubricated pump and a splash type lubrication. Again, this type of lubrication system helps prolong engine life. Finally, it features a pressure gauge and a operating switch as well. It is very durable from inside out. It is equipped with a cast-iron crankcase and a 240 Volt, heavy-duty induction motor. It can withstand extreme work environments, rough handling and the rigors of a long operation. This model is a pretty powerful air compressor with its maximum pressure of 155 PSi while still delivering a relatively quiet operation. It gives good value for the money as Industrial Air offers a two-year limited warranty. It is not the most lightweight or portable air compressor. Whatever the load is, you get the same amount of noise. If you are looking for something that really won’t break the bank, play it safe with Powermate. The Powermate VX PLA3706056 is significantly cheaper than most of the other products on this list. It boasts two cylinder pumps made of cast iron and a single stage engine. It is equipped with a pressure gauge and a switch for convenience and accessibility. But most importantly, it is oil-lubricated for a smoother operation. It is already oil-lubricated, making it ideal for DIY projects as well as farm and professional use. It features a cylinder body that’s designed to be thermally stable. From inside out, you get heavy duty and durable parts. This model is equipped with an aluminum head, valve plate, ball bearings (stylized for automotives), stainless steel reel valves and many more. It is shipped with an included synthetic oil making it extra convenient to use. It does not come with a regulator so you’d have to buy one separately. If you are not really low on budget and want to try something that surely won’t disappoint, the next product might be a good option. Quincy’s QT-54 is equipped with an industrial-duty Baldor motor. Its capacitor start motor comes with a built-in protection against thermal overload. Meaning, your engine is protected from overheating. It also boasts of its low oil carry-over (blow-by) rating which is less than 5 PPM. It can deliver 145 up to 175 working PSi which proves that the air compressor is pretty powerful. Its US-made, industrial-duty Baldor Motor can definitely withstand the rigors of a long operation and harsh work environments. This model boasts of its 30,000 hours’ pump-life rating which is pretty generous. It comes with a one-year limited warranty. But even better, Quincy also offers an extended warranty kit which you can purchase separately. However, the purchase must be made on the same date as the receipt. Moreover, the extended warranty kit and double the package warranty to 2 years and triple the pump warranty to 3 years (on-site parts and labor included). Their customer service centers are not as convenient or accessible to get in touch with. There’s a possibility of smoking when used too much. Finally, for our Niche Pick, Dewalt DXCMV5076055 has made it to our list. Dewalt boasts of its industrial performance as it can deliver up to a maximum CFM of 175 PSi. Meaning, it is possible for you to operate two or more air tool/device. On the other hand, its patented and original pump design reduces the temperature of the running pump. All in all, you get a very competitive 5HP air compressor ideal for industrial purpose or job sites. The electric motor comes with a thermal overload protection. This feature: protection from voltage fluctuations. This model does not require a magnetic starter. It is equipped with a wire form belt guard which improves compressor cooling. It is shipped with a full synthetic air compressor oil and comes with a 2-year pump, 1 year all other parts warranty as well. It does not come with wiring instructions. If you’re on a tight budget, it can be pretty pricey. Make sure to clean the fuel tank every now and then. Any build-ups, gunk and/or dirt can affect the performance of your air compressor. Always keep track of oil levels and change oil as frequently as need. Stale oil can damage the engine and affect performance. Always check to see if your air filters need to be changed. A dirty air filter will only make it hard for your air compressor to intake air. If your air compressor comes with a safety shutdown system, test it out first. This feature is what will keep your engine from damages due to overheating and/or low oil pressure. Always be sure to drain the moisture from your tank. Air compressors that are used in places where there is high humidity tend to accumulate moisture faster. Follow your air compressor’s manual carefully. Don’t hesitate to contact the seller or manufacturer if there’s something unclear. Before going on a splurge, it is best to set some things straight. Like any other devices, you have several factors to consider before buying an air compressor. Your preferences or needs and your budget comes first. That is a given. This is a very important factor to consider if you want a smooth operation. No air compressor will ever run without a power supply. Thus, you only have two options: a gas-powered model or an electric-powered air compressor. For work environments that have limited electricity supply such as construction sites, a gas-powered model is the most ideal. On the other hand, if you are planning on doing some indoor or DIY home projects, the electric-powered mode might be more suitable. If you will be taking out your air compressor to job sites or other places, portability becomes a very important factor. You want to make sure that while your air compressor isn’t the lightest or the smallest, it is still portable enough. For this factor, you have two choices: the stationary air compressor and the portable air compressor. Both have their own strengths and weaknesses. The portable air compressor is great for easy and simple projects. They also require minimal effort when being moved around. However, you get limited power as well. Most importantly, you might encounter problems working with a portable type in places with power scarcity. On the other hand, stationary air compressors are generally more powerful. Thus, they are also heavier and bulkier in size. If your line of work is very demanding but does not require a portable unit, this might be for you. 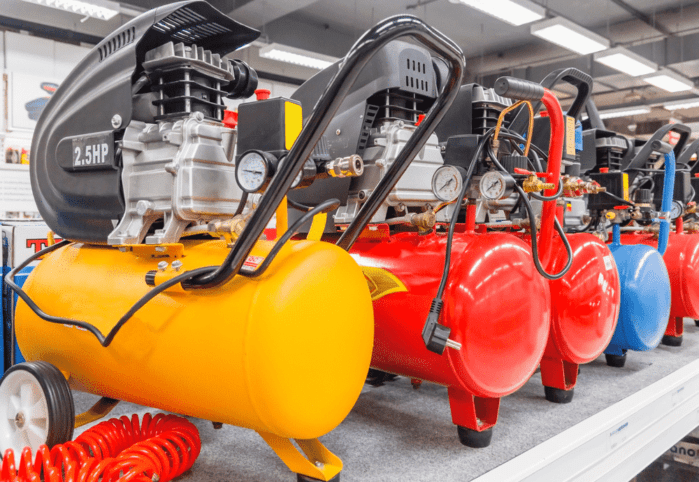 Although this article is specifically for a 60-gallon air compressor, you might want to mind these two factors just to be sure. In relation the nature of your project as well as your needs, you to take note of the tank size and capacity. For industrial purposes, you will need a more powerful air compressor with a bigger tank size. A higher CFM, horsepower, PSi, and runtimes are good parameters to measure which is an industrial grade air compressor. You might also want to look into the air compressor type. Are you opting for a piston type? Or a portable device? The portable type does not need any other fixtures such as the tank to operate. A single-stage air compressor is ideal for “heavy-duty” jobs at home while a two-stage compressor is best for industrial purposes. Or jobs that require long, uninterrupted operations. Finally, the portable type is only best for general home use. In the end, the best air compressor for you will all depend on your needs and budget. However, if we will be basing this on the factors we’ve listed above, the one from Puma Industries might be for you. It is very reasonably priced and it does not compromise on quality and performance. It is also equipped which features that make it reliable. But most importantly, it is very durable and highly portable with its never-flat wheels. All in all, it is a good bargain for its price. We hope you found this article helpful. We wish you luck in your hunt for the best air compressor. Thank you for reading!